The Gateway of India is a monument built during the 20th century in Mumbai City of Maharashtra state in Western India. It is located on the waterfront in the Apollo Bunder area in South Mumbai and overlooks the Arabian Sea. The structure is a basalt arch, 26 metres (85 feet) high. It lies at the end of Chhatrapati Shivaji Marg at the water's edge in Mumbai Harbour. It was a crude jetty used by the fishing community which was later renovated and used as a landing place for British governors and other prominent people. In earlier times, it would have been the first structure that visitors arriving by boat in Mumbai would have seen. The Gateway has also been referred to as the Taj Mahal of Mumbai, and is the city's top tourist attraction. 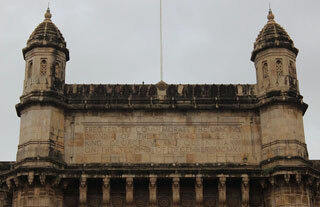 The structure was erected to commemorate the landing of King George V and Queen Mary at Apollo Bunder, when they visited India in 1911. Built in Indo-Saracenic style, the foundation stone for the Gateway of India was laid on 31 March 1911. This article uses material from the Wikipedia article "Gateway To India", which is released under the Creative Commons Attribution-Share-Alike 3.0 License.